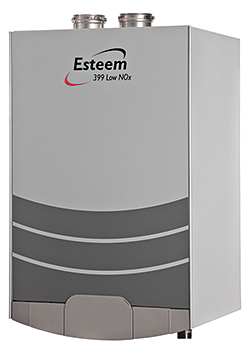 The Esteem 399 wall-hung unit delivers 3.6:1 turndown and 95 percent efficiency, which improves system operation and reduces overall energy use in applications requiring 112,000-399,000 Btu per hour. A corrosion-resistant, stainless-steel, fire-tube heat exchanger makes the boiler appropriate for efficient, condensing, hydronic heating systems. The heat-exchanger tube design maximizes thermal efficiency and creates flue gas and water turbulence.